My data is extremely important to me; the irreplaceable memories, music, and movies that I keep on my home server are duplicated across multiple drives in a Windows Home Server. WHS provides me with some peace of mind by implementing a feature like folder duplication, however implementing only that type of protection is not enough. There are many solutions by many different companies out there to tackle my server backup that claim to be easy and are not, seem to be inexpensive but have hidden costs, or just don’t offer enough storage space. Well, where the other solutions fail, StarTech shines. Enter the S354UFER. 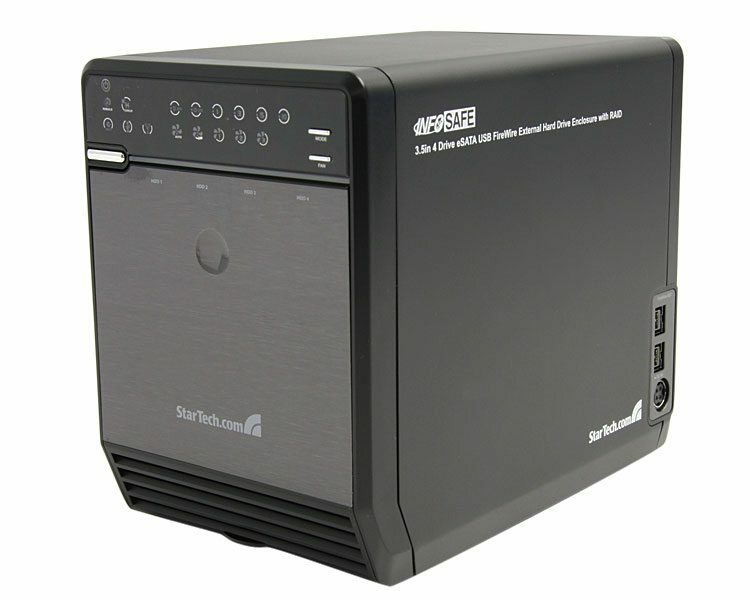 The S354UFER is an external SATA Raid enclosure capable of housing 4 3.5″ hard drives for a total of up to 8 terabytes of storage. If your flavor is USB 2.0, Firewire 800 / 400, or eSATA the S354UFER can accommodate you. StarTech has chosen to garnish this enclosure with an internal RAID controller allowing you to choose from RAID 0, RAID 1, RAID 0+1, RAID 3, and RAID 5, and the configuration is simply done by pressing a few buttons on the front of the device. You need not be a system administrator to have this thing up and running in a matter of minutes. As far as the looks go, I wouldn’t really consider this unit a “centerfold”, but definitely more than a “one nighter”. The front is decorated with some snazzy LED’s that light up based on your RAID configuration, LED’s for fan speed and auto and manual cooling selections, some buttons to configure RAID along with a power button, activity LED’s for each drive that light from blue to purple with activity, and a front door that opens and removes easily to expose your precious hard drives. Fear not loyal user, as it is not exactly easy to accidentally remove a drive from your new vault as StarTech has equipped the S354UFR with a plate that locks in place and must be removed before your snug little drives can be removed. A solid design that may be just a little too solid as installing the metal cage proved to be an exercise in patience and strength. Each drive is installed by utilizing removable drive handles and are installed from top to bottom and StarTech asks that you install a drive in the bottom of the unit to help with reinstalling the cage that keeps everything snug. StarTech also chose to go with a “user friendly” way of numbering the drives; instead of going with the standard “HDD 0 – Drive 3” that us geeks have come to know, StarTech chose to number things the way a normal person recognizes them… HDD 1 to HDD 4.